With no time to read the diary from start to finish, she turned to the last page, examining the final entry dated Thursday, 22 January 1953, a scrawled, cryptic sentence: "I am me and my circumstances". She recognised the phrase from school: it was Ortega y Gasset. A literary quotation from a secret policeman? Guardia forensic scientist Ana Maria Galindez drives through the baking heat and the arid, rocky landscape towards another civil war grave, a bricked-up mine containing fifteen corpses now a heap of intermingled bones. She is introduced to the former manager and to a Professor of Contemporary History who had found a reference to the grave in the diary of a Comandante Guzman. The mine closed in 1953 and the mining company went out of business in the 1970s. This is not a Civil War grave after all, realises Galindez. The killings took place afterwards, during the Franco regime. In the Professor's opinion the killers would not have worried about matters of law – because they were the law. Comandante Guzman oversees the operation to trap the fugitive. The operation is a success. Guzman kills the man in an alleyway by way of a satisfactory conclusion. Back at Special Brigade headquarters, he is visited by General Valverde. A group of Dominicans are interfering with the General's pharmaceutical dealings and naturally, being part of an American Trade mission, they are off-limits. Nevertheless, although this is a diplomatically delicate matter, Valverde trusts that Guzman can find out what the Dominicans are up to. He trusts that the package on the table will help motivate Guzman. Later Guzman opens the package and hides the fortune in American dollars that it contains in his office hidey-hole. At his home there is another secret hiding place, from this one he takes his file on General Valverde and settles down to read it. But not before he has checked the street below and caught a glimpse of a lighted cigarette in a doorway; no surprise to Guzman to know that he is being watched. THE SENTINEL is the first part of Mark Oldfield's "Vengeance of Memory" trilogy and is set in Spain, a country that the writer and criminologist is passionate about. Oldfield has said that it was the views and experiences of the Spanish people he talked to, their opinions and witnessing to the opposing virtues and cruelties of Franco's regime that determined his subject matter. What is unusual is Oldfield's decision to make his key protagonist the "bad guy" – Comandante Guzman, a violent, volatile yet calculating agent in Franco's secret police. Oldfield tells Guzman's story from the perspective of his rise to Franco's notice during the Civil War, his subsequent career during a harsh Madrid winter of 1953, and in present day Madrid – the divergent views of his role as uncovered by an ambitious, opinionated professor and the investigations of Ana Maria Galindez of the Guardia Civil. THE SENTINEL is a suspenseful, detailed thriller made all the more mysterious by the presence throughout of the watchers – known as “The Sentinels”. Set in a "dog eat dog" world where no one is who they appear to be, it is an accomplished feat of timespan construction, and a big book with believable characters. But such is its scale, I experienced it as almost relentlessly bleak and dark by the time I reached its end. Another much shorter and crime-focussed book, recently published and referring back to the experiences of the Spanish Civil War and Franco's regime, is the THE ANARCHIST DETECTIVE by Jason Webster. Both writers depict a country and culture that they love and have lived in. Both do it well. It is a question of literary “architecture” as to whose book you may prefer. 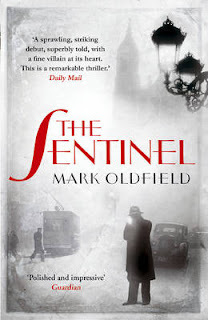 For those who love to get their teeth into a big trilogy, in this case one which encompasses the dark heart of Spanish twentieth century politics and social history, Mark Oldfield's THE SENTINEL will provide a large meaty bite.